This is the ultimate quintessentially British wedding complete with fish & chip supper wedding breakfast. 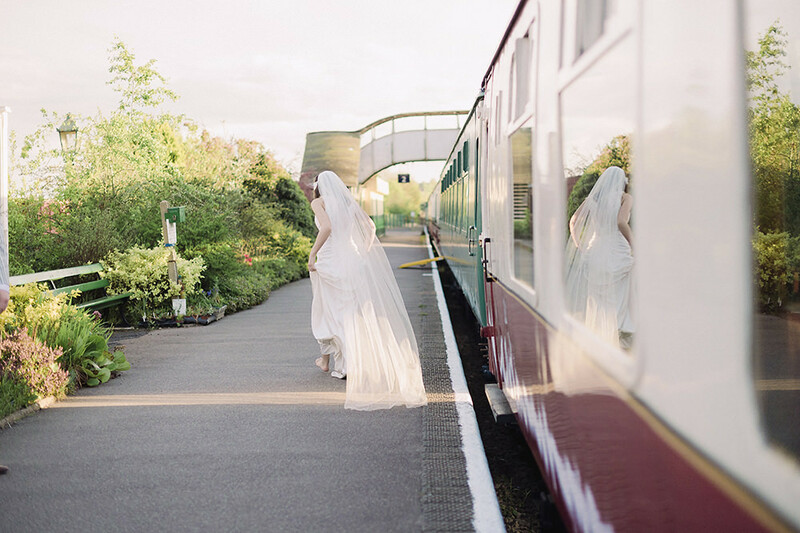 All done on a miniscule budget with the most fabulous DIY decor and high street fashion, and all looking absolutely vibrant and fabulous at the East Anglian Railway Museum in Essex. 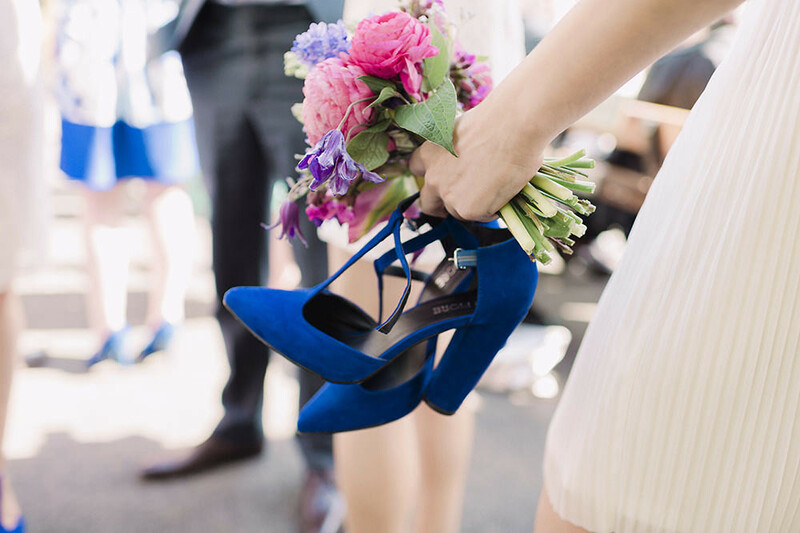 You’ll be spoilt for choice with all the projects to see & pour over and there is no denying that Bride Fiona’s brightly coloured affair will inspire you and help you dream up your own fabulous wedding on a shoestring. Plus the fashion, style and photography by Razia Jukes is absolutely stunning. 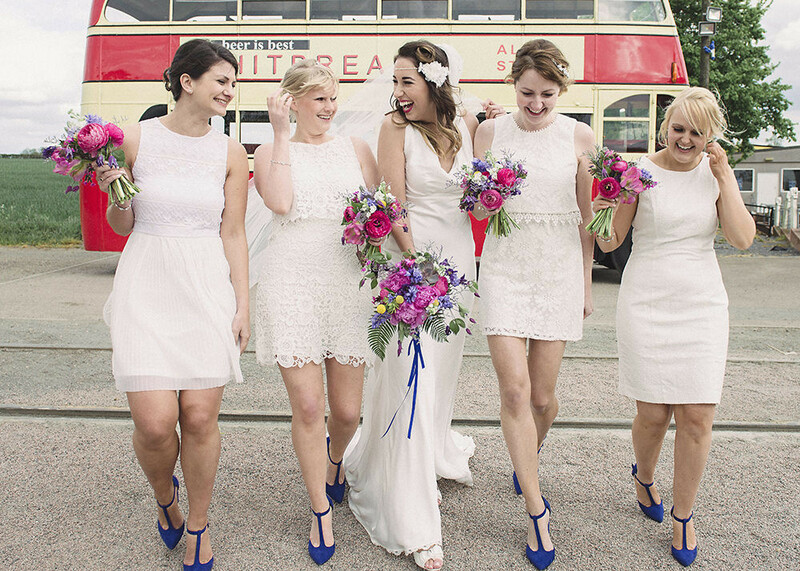 Slightly boho, slightly vintage and definitely so much fun! Fiona The Bride: All of my outfit was purchased from Boulevard In the quaint village of Earls Colne Essex just outside of Colchester. It was lovely to go there as my friends Aimee & Val own the shop & run it beautifully. I was sorted head to two with in a couple of hours on my first day of dress hunting! They know me better than myself I think as Aimee picked out the dress & accessories & urged me to try it on. I’am so glad I did as it was just perfect. I felt like a Hollywood movie star! One of my clients gave me a silver sixpence to put it my shoe. My Bridesmaids were Katrina Charlotte Kerry Sam Abby & my little Sister Brooke. All their dresses were under £45 & bought from different high street shops in the sales apart from my Sisters whose dress was £45 from Monsoon children along with her lovely little silver heels. I was so pleased with how the dresses all worked together on the day as it was very hard to get my Bridesmaids together all at the same time to try them on. I really wanted them to be comfortable & happy with their dress so feel I achieved that & at a great price too. I bought their headpieces from Clare’s Accessories for £5 each. They did their own makeup & Abby & Kerry both hairdressers did the Bridesmaids hair. As I am a Hair stylist my self that specialises in wedding hair I new I would feel much more comfortable doing my own hair on the day & I enjoyed creating the Hollywood waves & kiss curl, I felt just like me, it’s very important to channel yourself as a Bride not just a stereotype of what you think a Bride should look like. Dan bought his stripy jacket from a shop he happened to drive by in Saffron Waldon & saw it in the window of GrayPalmer. It was in the sale at £70 so it was obviously meant to be! That’s all I knew about the Grooms party outfit’s, the rest was a surprise! They found their chinos in Next for £20 each and they all had different brown shoes & British style socks on. Our wedding invitations were designed by myself in the stlye of a WANTED / CIRCUS poster in black & white, then we had a local printer print them for £90 which we then rolled up with string. 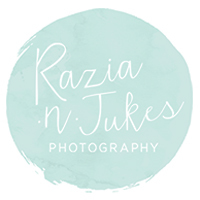 I found our photographer Razia Jukes on a wedding blog. I never thought she would be interested as she’s from the other side of London. but thought there was no harm in asking. We felt so lucky to have her so keen to shoot our day & honestly she could not have been more perfect. We never once felt pulled around, we felt we had know Razia for years! And the photos we have 100% reflect the fun & happiness, they almost feel as though they are a video they tell our day so well. Our flowers were from The Country Garden Flower Company. We first met them at our wedding venue when they had a stall at a 40’s event that was being held there. Their flowers looked as though fairies had put them together, all grown from their own walled garden just outside of Colchester. Deciding on what flowers to have I said Imagine you are off on a train with a picnic heading to the seaside, that’s what I want! I think they channeled my vague description exceptionally well. My sisters wreath was amazing with such wonderful colours. We collected the vintage milk bottles from our holidays in Pembrokeshire & a lot of my clients & friends also collected jars that my Bridesmaids & I decorated. We also drank a lot of orangina to get the lovely little bottles we bought in France. 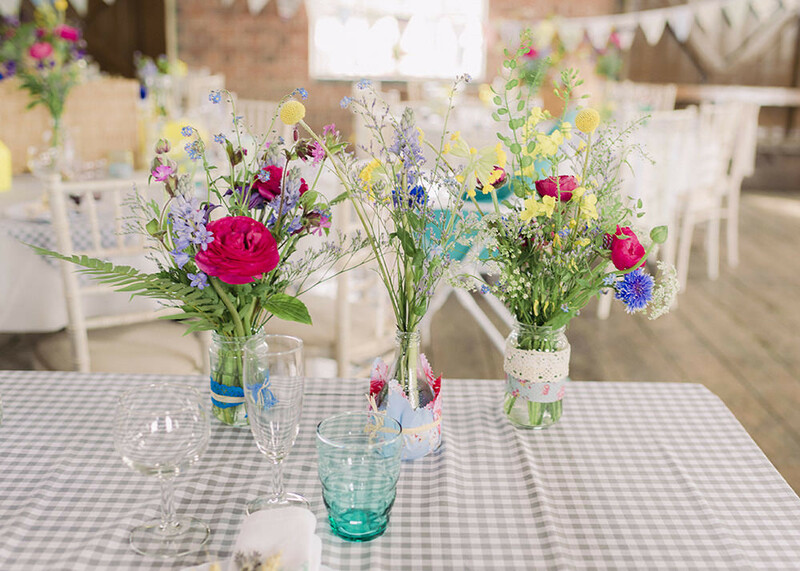 The florist filled them all wonderfully and we made made our table plan ourselves. We were married at Colchester Town Hall in the Mayors Parlour with grand ceilings & nice long aisle. We were even aloud our dog Bear there too! As I walked up the aisle he was waiting patiently at the side of Dan & I couldn’t resist bending down & kissing him first! We then had photos on the balcony & grand staircase. Our reception was at the East Anglian Railway Museum in Chappel Wakes Colne. 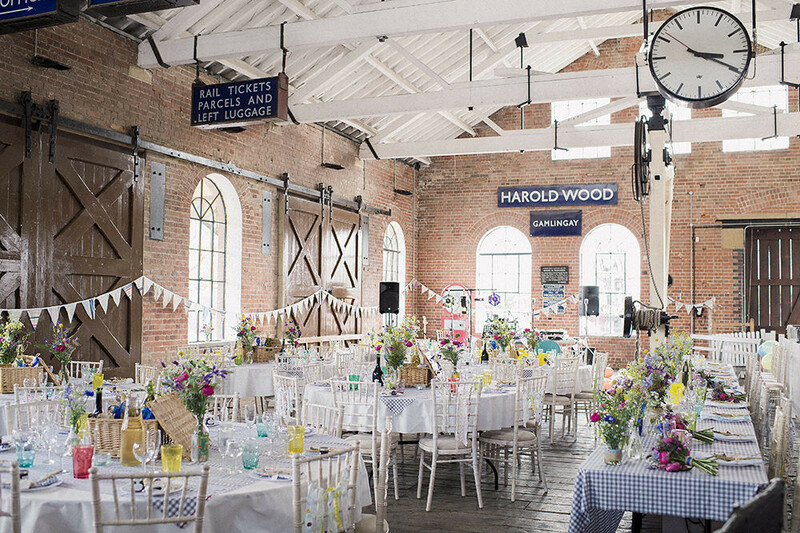 For us it was the perfect venue as it allowed us to be creative without lots of do’s & don’ts! Plus no one we knew had had there wedding there so it felt truly personal to us. After seeing lots of formal grand venues with wedding planners we were left overwhelmed slightly stressed and in need of paracetamol for our headaches from hearing how our big day would be planned out minute by minute with no time to breath let alone use our own minds. That’s why when we saw the Museum we were blown away knowing we could have a relaxed fun day all decided by us & best of all no corkage charge or restrictions on caterers or entertainment. We had a welcome drink of Pimms out of glass jars with chunky colourful straws and propper corn popcorn with the chance to play cricket on the green. We also had www.flosfryer.co.uk as our mobile fish & chip van they were exceptional. Extremely kind & punctual seen as we were let down by our original caterer of picnic food a month before our day. We were over the moon with the service of top quality fish & chips. My Mum made our rustic wedding cake, Victoria sponge with buttercream strawberry jam & fresh fruit with organic eggs straight from the garden. My Aunty Nathalie & Mums partner Nick helped to make all of the other delicious cakes. It was very important to me to have a big selection of British style cakes, everyone loves cake! Our theme for the day was basically anything quintessentially British. We were adamant we wanted a relaxed day that reflected us 100% we didn’t want a perfect Pinterest day. We wanted to stand back & say wow we did this and if anything wasn’t quite perfectly colour coordinated then it didn’t matter, the more eccentric the better! P.s don’t get me wrong I love Pinterest its just remembering to put your spin on it too. My Aunty Diane that lives in France with my Uncle Michael she collected miss match napkins from French markets and even found a set of vintage white napkins with F&D already embroider on them, what are the chances! She also made our Gingham table cloths & wrote the calligraphy luggage tags. We picked the wheat & lavender from their land too & dried it out over the year. I got doilies from different charity shops & wooden cutlery from eBay as well as plastic plates & colourful glasses from ikea & Home Bargains at a very small cost. We hire wine glasses from Sainsburys for free and had wine brought over from France by my family. I made the chair back by roughly tying strips of different fabric lace & little pom-poms on to string. Just to add a little colour & a bit of fun. I made the bunting from old curtain swatch books that were in the loft of my local material shop for £10! I made a chalk board love story by painting a large bit of MDF and using chalk pens wrote our story. I put together colourful sandwich boxes full of colouring pages toys Lollies & games for the children & using colourful material tape attaching pencils to the front. We hung photos in side the train carriage & colourful balloons on the floor. We wanted a picnic style the, to the tables so took the lids of the picnic baskets & attached behind them so that all of our guests could see one another. We also had a basket full of blankets for those that wanted to get snuggled. Our day started with myself and my Bridesmaids getting ready at The Rose & Crown Colchester. 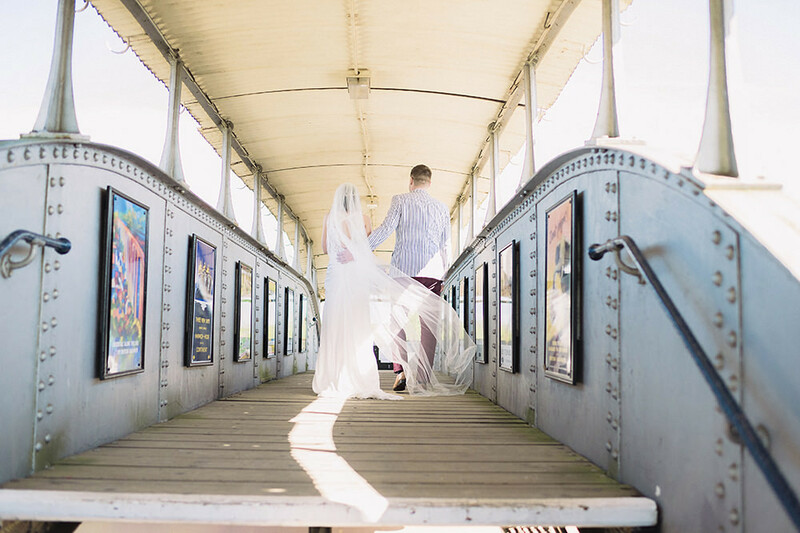 All of our guests got on a vintage red double decker bus that took them to the town hall then on to the venue which was great fun. 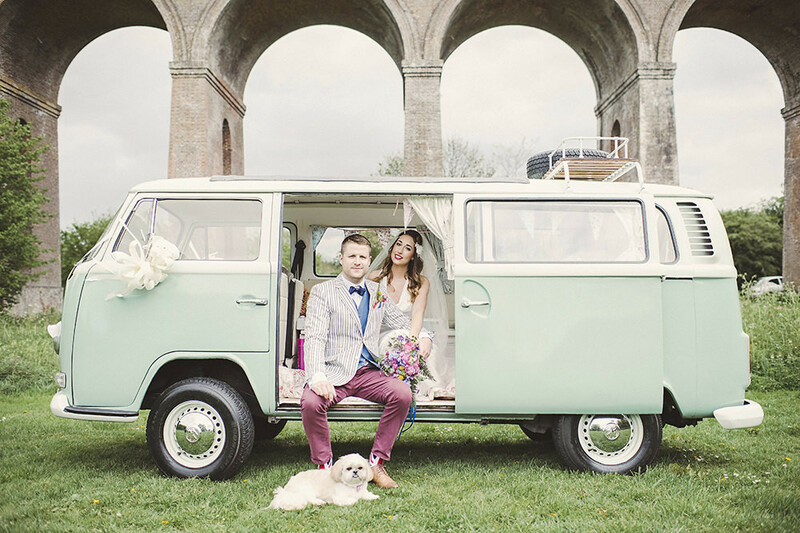 I was escorted with my Bridesmaids in our friends Shane & Chelsea VW camper called Bertie. They were frantically restoring it right up to the week of our big day and did a wonderful job with just married sign & bottle of bubbly for the new bride & groom after the ceremony we went of to have photos taken at the Victorian viaduct at Chappel were Dan gave me a boost up in my wedding dress just as the wind whipped & a black clouds & a rain came over it actually worked wonders for the photos & we just had to laugh about it. The speeches were great. Greg’s was written as a poem which was really refreshing & Dan got up with his Groomsmen & sang afternoon delight in the style of a barbershop quartet. All of the evening entertainment was a surprise for me which was really lovely. Fox Wiggle and Sas are a vocal harmony trio specialising in music from the 1940’s started our evening off which was wonderful. We are lucky enough to have them as friends of ours. They got all ages up dancing & really fit the theme well. Then we had ‘missing Andy’ play for us who are also friends, followed by lots of different sets of friends get up to do half hour sets of different live acoustic music. 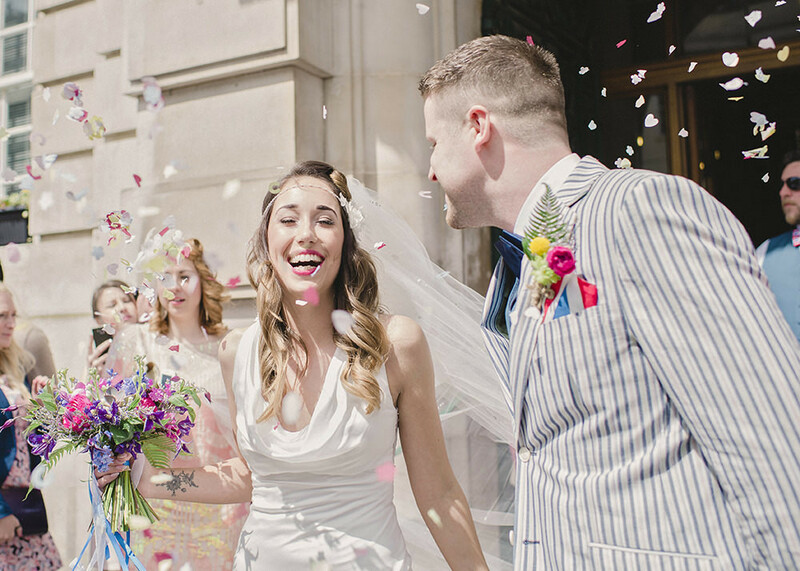 We felt so lucky to have everyone’s talents around us & all of their love in our special day. Our evening ended with us running through a long tunnel of arched arms, it was so overwhelming and amazing. Then we got whisked straight off to Gatwick for our Mauritius honeymoon! Is was imported to us to try and keep the cost of the wedding day down and be as creative and resourceful with money as possible so that we could enjoy a once in a life time honeymoon. My only advise is to keep your cool & stay true to yourselves. Planning this wedding has taught me to use my voice and stand up for what I want and what is best for us as a couple. Everyone wants to help in their own way so it’s much easier to be brave and just be honest with them on what you like and don’t like otherwise before you know it you will end up with a roulette table & a 101 different decorations! wow this is absolutely fantastic, love everything about this wedding! beautiful photos, the reception details are so unique! What a beautiful wedding! Love all the little details and it just goes to show that things don’t need to cost the earth to achieve a brilliant effect on the day. Fish & Chip supper? My kinda wedding. I love the cake and the colourful flowers, simple yet beautiful. This wedding was so much fun from start to finish (including helping the day before and clearing-up the day after !) Fiona and Dan involved lots of friends and family in the preparations for their big day and it really paid off as we could all see how our little bit fitted in with the grand scheme. They did a wonderful job and their wedding was truly a celebration of their love for each other and our love for them. Just goes to show you don’t need to spend a fortune. We have a large repertoire of 1940s music as well as a fantastic postmodern jukebox style ‘Modern Vintage’ set which includes lots of well known songs covered in a 1920s-40s style – which is great if you’d like your band to be in keeping with your vintage theme but still play songs that everyone knows! We are available with a full live band from June 2016 onwards, but for more intimate gigs and those with a smaller budget we play an equally energetic gig with backing tracks. This is what we did for Dan and Fi’s wedding and many a packed dance floor can attest to the effectiveness of this way of doing things!